Servicing & maintenance is a vital requirement - especially if your appliance is to be efficient, work properly & most importantly safely. 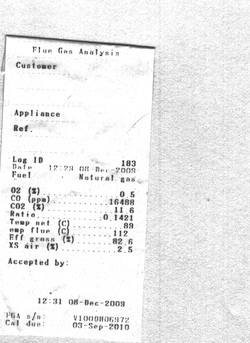 We also use high tech equipment (flue gas analysis) to ensure your appliances are operating correctly. Copies of which will be left on-site after a service call. The receipt opposite was taken from an appliance I came across 4 years ago. The customer was at the time, having treatment for blood poisoning (thought to be from an infection). After my visit & her recall to the hospital it was found she was suffering from Carbon Monoxide poisoning! The story had a happy ending & within 2 days she was well again. Needless to say the appliance was made safe! We can also offer solar assisted/ Gas hybrid systems that make the absolute most from our sunshine. These systems also can assist your heating bills considerably in the colder months. 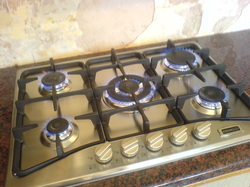 We also offer the installation, service & repair to all domestic gas appliances including upgrades from bottle to tank systems. 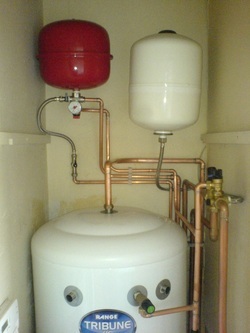 We also carry out full annual servicing of oil fired boilers, including a thorough flue gas check.